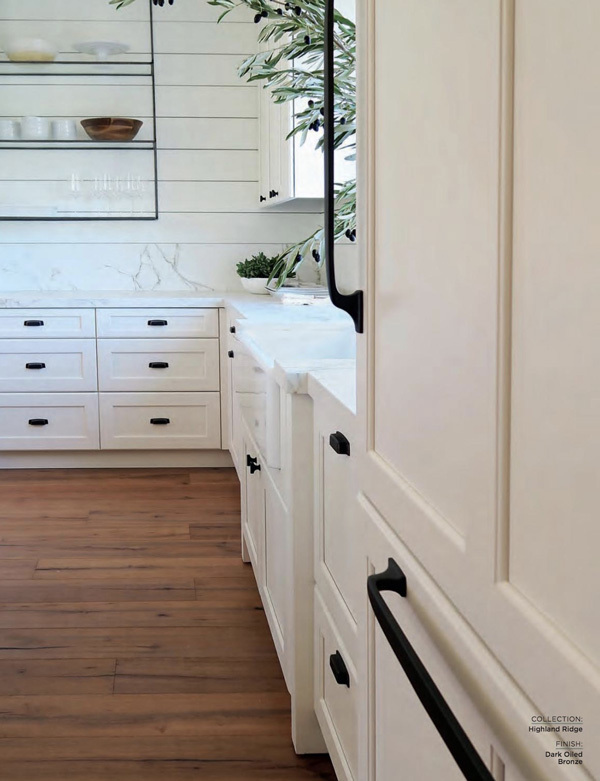 Trying to determine what length pulls or handles to use on your cabinets can feel daunting! Luckily, I’m going to share the exact options you can use for each common size cabinet drawer or door. Cabinet hardware is a major passion of mine right next to paint. 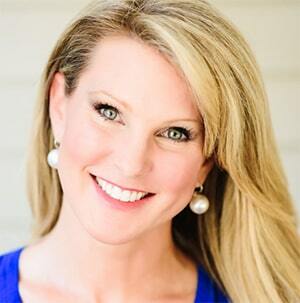 It’s also an area I have expertise in, after working for the major hardware brand Amerock and launching 200 new products! Having to determine what sizes to develop for new product lines and then use in our cabinet hardware product photography / catalog was a major part of my job. What I can tell you is, there is no “standard” length pull you SHOULD use. I’m serious! Instead, I’m going to show you the variety of pull/handle lengths with guidance on what fits on common cabinet drawers and doors. Center-to-Center– the distance from the CENTER of one screw hole to the CENTER of the other screw hole. 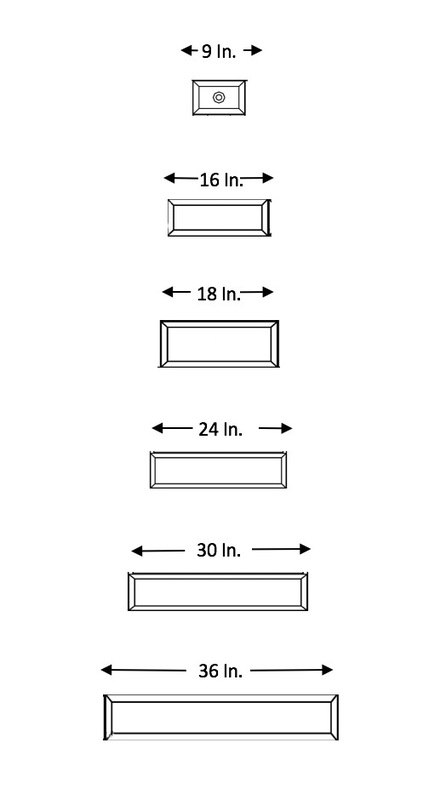 This is the standard industry measurement for sizing cabinet handles. Overall Length– the distance from one end of the pull to the other end. This measurement is always greater than the “center to center” measurement. Projection – measures how far the pull or knob sticks out from the surface of the cabinet door or drawer after it is installed. Diameter– self-explanatory in a round knob, but the diameter of a pull or handle, if given, refers to the width or thickness of the bar portion of the pull (the part you grab). You can see here the length is much longer than the center to center measurement – even though they are the same! The overall length typically will not be more than 2 inches greater than the center to center measurement. The BEST way to test the length quickly and easily? If you currently have holes drilled in your cabinets, obviously for pulls that will dictate the length you must buy. Record the measurement in inches (if you are in the US). Use an online calculated to convert to metric. 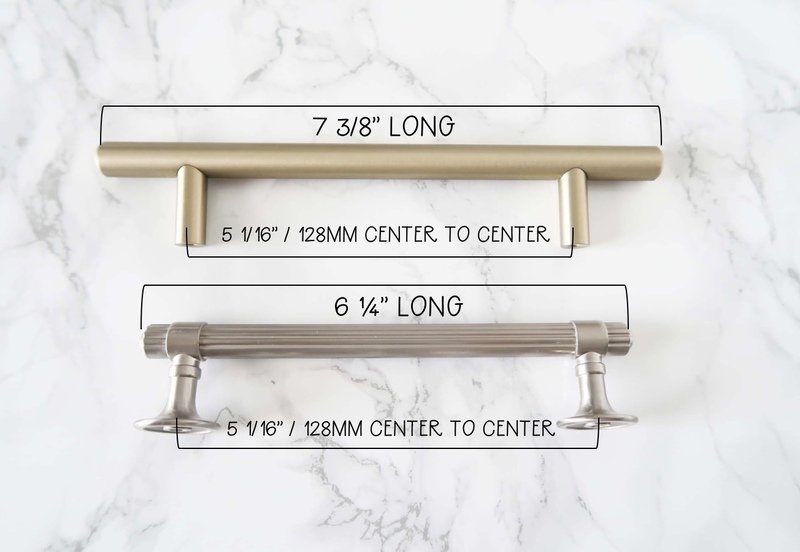 Now that you know the lingo around cabinet hardware measurements, let’s review the most common sizes of hardware. 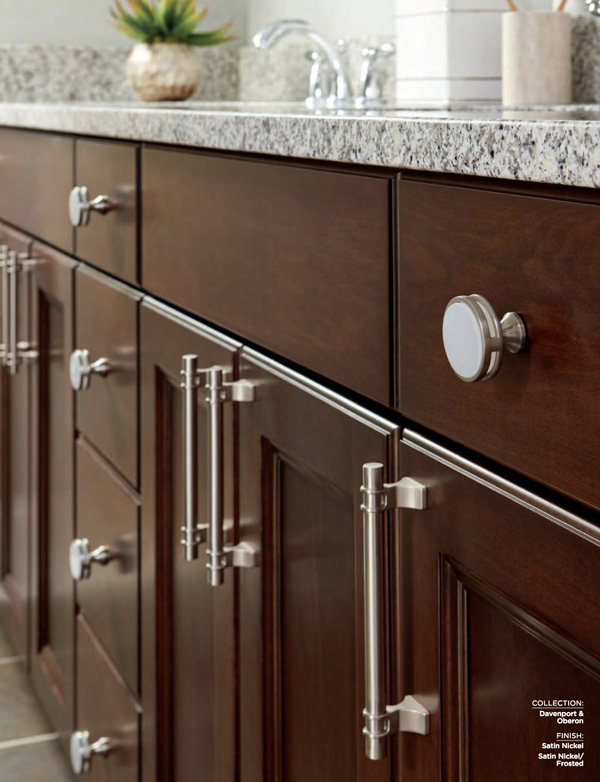 Knobs typically have one hole for installation and can be round, square, rectangular or a t-bar. Pulls also come in common sizes and as I mentioned earlier you need to pay attention to 3 measurements: center to center, overall length, and projection. You order pulls based on these common center-to-center measurements (the industry goes metric the longer the pull – no idea why!). 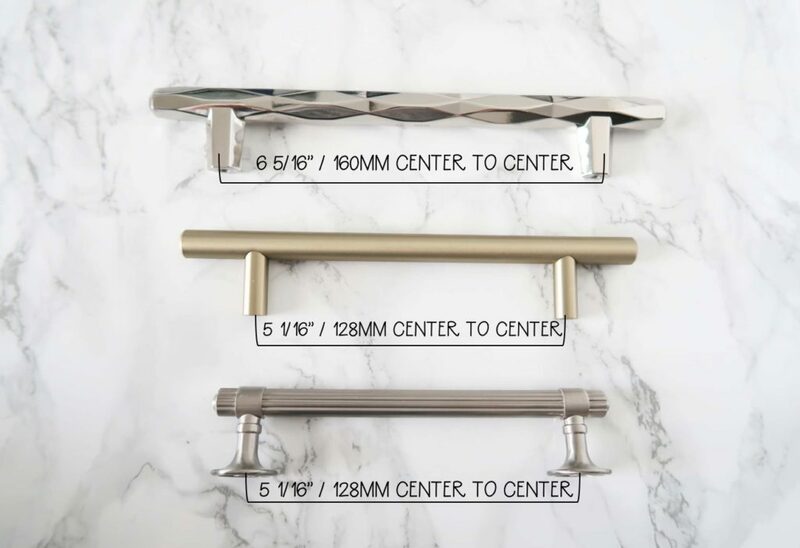 Cup Pulls are another options that are typically 3 inches or 4 inches. Bar Pulls, as shown below, come in WAY more lengths and also come very long. So if that is what you need, start with a bar pull. They are the most common pulls you see due to their simple styling, narrow diameter, and affordable price. So you have a real life example kitchen, I’ll use my own! My kitchen is in a spec home and has some custom options, so there is a wide variety represented. This is where you may be surprised by what I’ll say: do what you want! 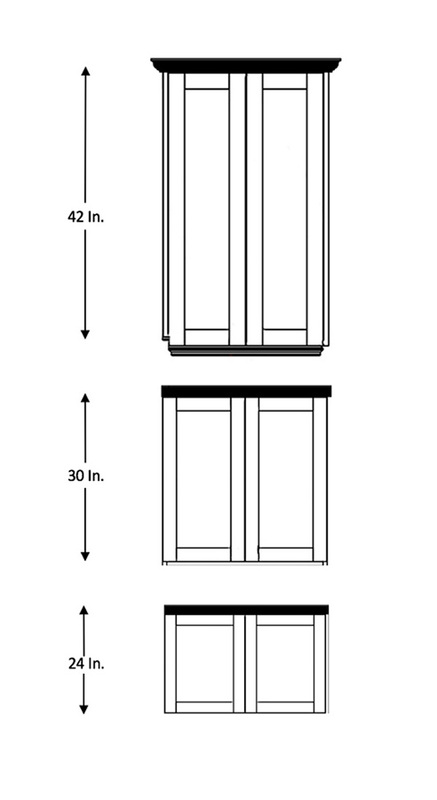 There is no “correct” recommendation of pull by drawer or door length are height. However, there are limiting factors. You can’t put a pull on a drawer that is wider than the drawer 🙂 That is common sense. In some instances, if the drawer is really small you will only have the option of a knob or a 3 inch cup pull. Easy! The picture with the espresso stain is my son’s bathroom – lucky kid. 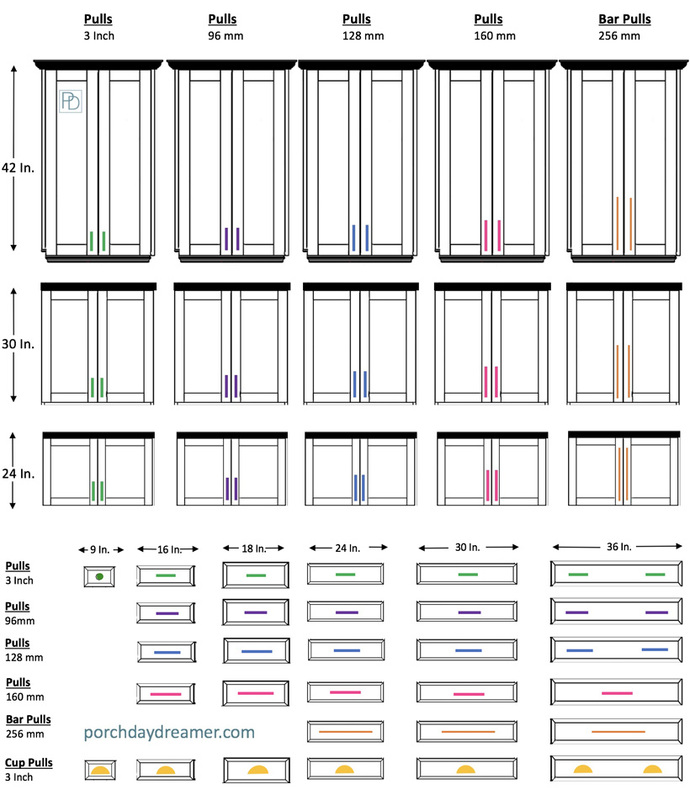 The graphic below shows is a nice visual of approximately how each common size of pull will look on a cabinet drawer or door. All of the sizes I mentioned above, so if you need to review that again. When you get to the 36 inch drawer widths, it gets a little tricker. Due to the long length and the limited pull lengths for sale outside of bar pulls, I’m recommending 2 pulls per drawer. When you take everything into account, it all comes down to personal preference of the look you would like to create. 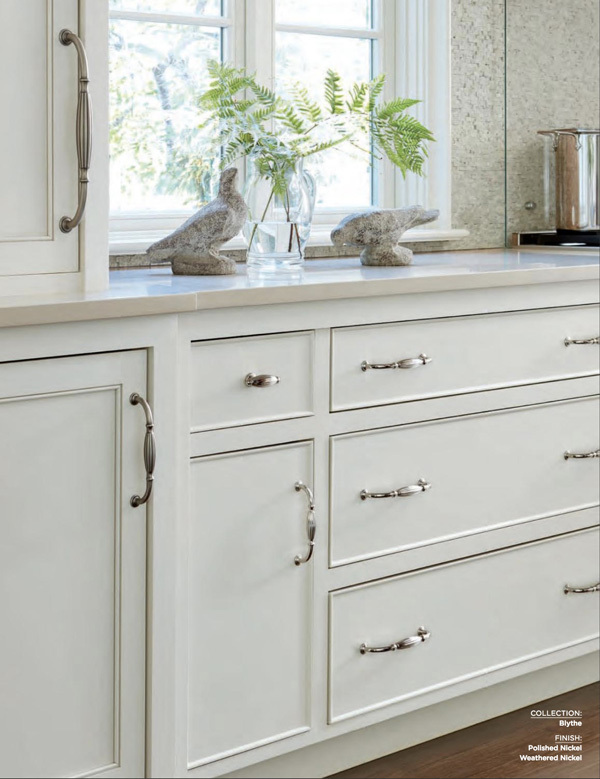 Do you want the cabinet hardware to be the most prominent feature on the cabinet drawers or doors? Are you going for a more stream line modern look? Is your style more traditional and you want the hardware to be more functional than decorative? 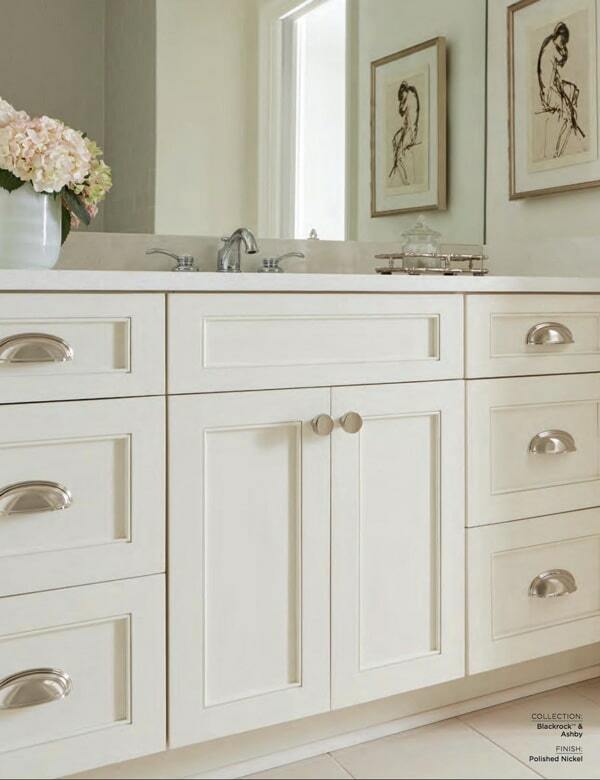 Mix up knobs and different lengths of pulls to provide visual interest. If you want a more modern look, doing all bar pulls is a nice option because there are so many finishes and lengths. 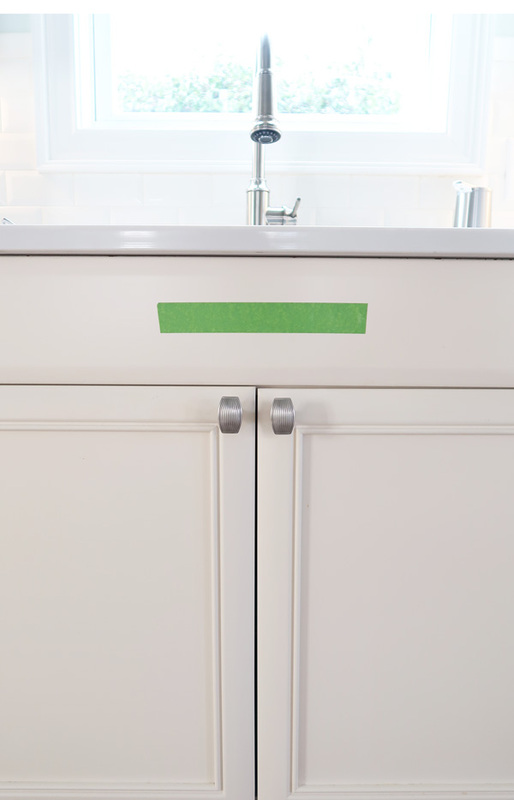 To modify a kitchen that currently has all knobs, install pulls in some of those locations – that’s what I’ve done. 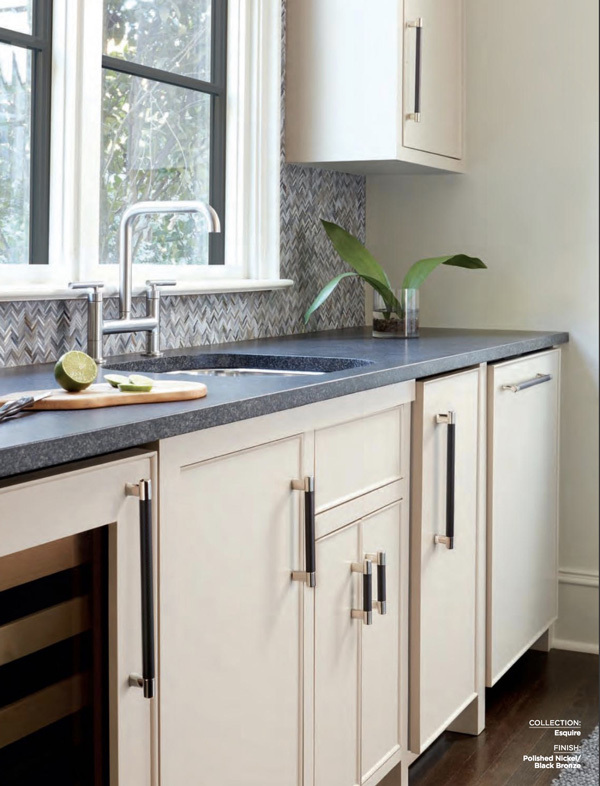 If you would like more information on choosing cabinet hardware in general, read this post. 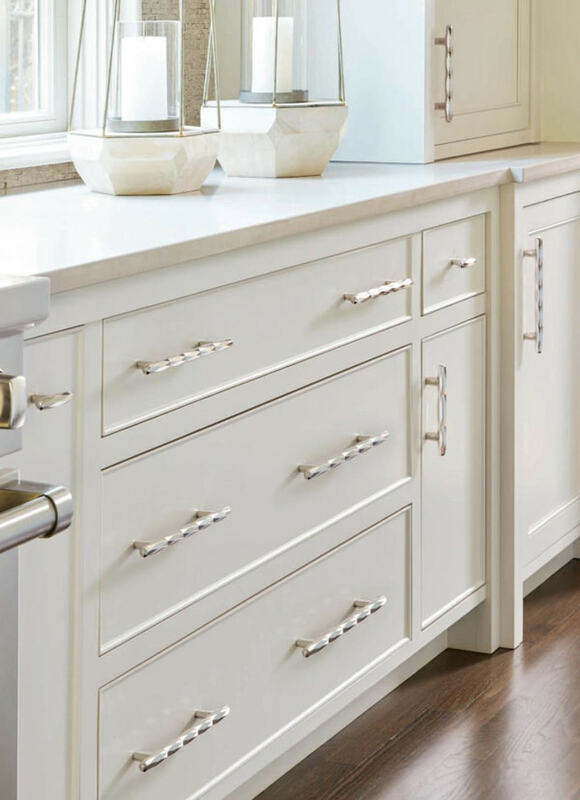 Here are more beautiful pictures of different cabinet hardware options to inspire you! 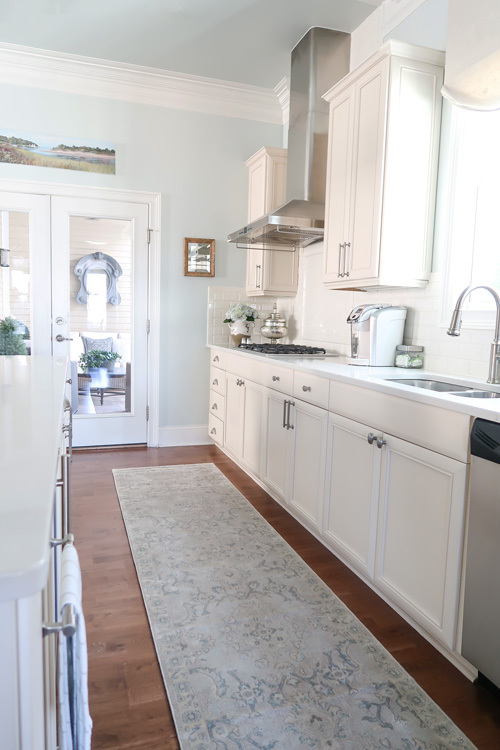 My hope is to have instilled confidence in you that you don’t need a kitchen designer and can choose plus layout hardware yourself! 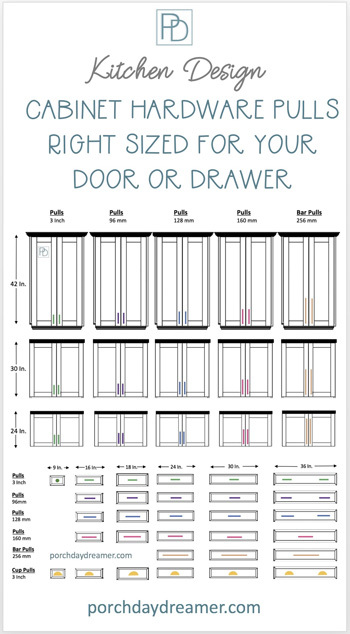 Plus now you have a graphic that SHOWS you how different lengths of pulls will look on your cabinet doors and drawers. You can easily refer to it as you plan and shop. You are now armed with the lingo. 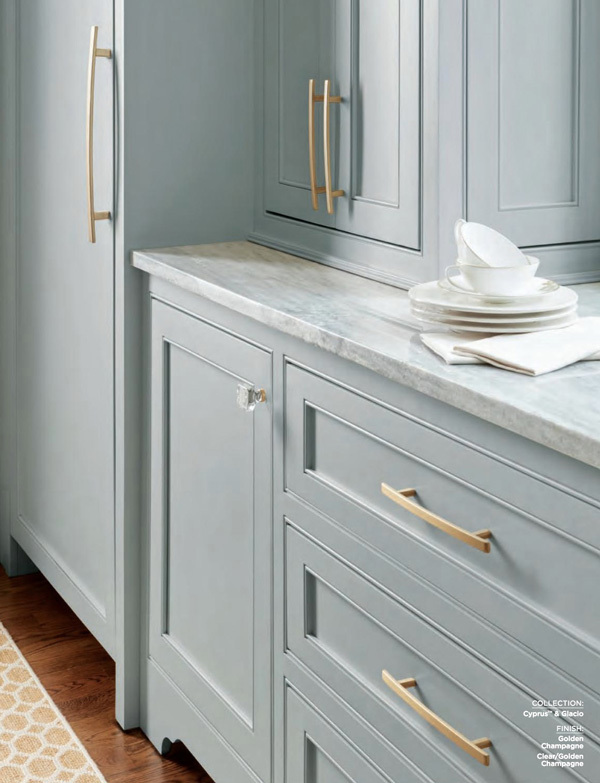 It’s time to go shopping for cabinet hardware you love! 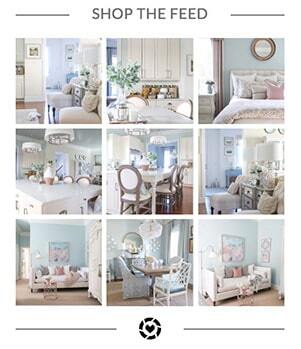 The collections I’ve feature have more sizes and finishes. The catalog is linked below. Are you a DIYer? All of the hardware in my home I’ve installed myself. You just need a simple template, a power drill, and the hardware! This was the FIRST video I ever recorded, so when I say level it means “plumb” which is the vertical on the level. I didn’t have all my tools ready, but hey you’ll get the idea of how to do this yourself! Do you recognize the bathroom from the images above – yep, I am proud of my handy work that ended up in the Amerock catalog! Please consider signing up for my weekly email newsletter, so you never miss a post, tip or trick. Who knew there are guidelines for cabinet pulls! Such an amazing amount of information. Will pin so I can have it when I get to change my knobs and pulls in my house! Thanks! Great post. I love the Amerock hardware and I am using it in my kitchen. Amerock BP36655CBBZ Glacio 5-1/16″ Center Cabinet Pull, 5-1/16 in (128 mm), Clear/Golden Champagne. is what I chose to use. I would love your advice on a design dilemma. We are currently going through a remodel and will have a open floor plan with a Great Room. Should I use the same hardware on my built- in cabinets in the family room or go for a furniture hardware look. The cabinets are white in both rooms and I have walnut freestanding shelves. Glad the post was helpful! Not sure if you are wanting a more modern or traditional look. Since the Glacio pulls are clear and look more like a bar pull, it frees you up to do what you want. Search the Amerock site for Golden Champagne collections to see what options are available. Cyprus, Sea Grass, Bar Pulls, Mulholland -come to mind that may work. You can mix finishes – it depends on the look you want. Thanks for your quick response. The look I want on the built-in cabinets is more of a formal furniture look. My house is traditional but trying to get a more contemporary or transitional look.